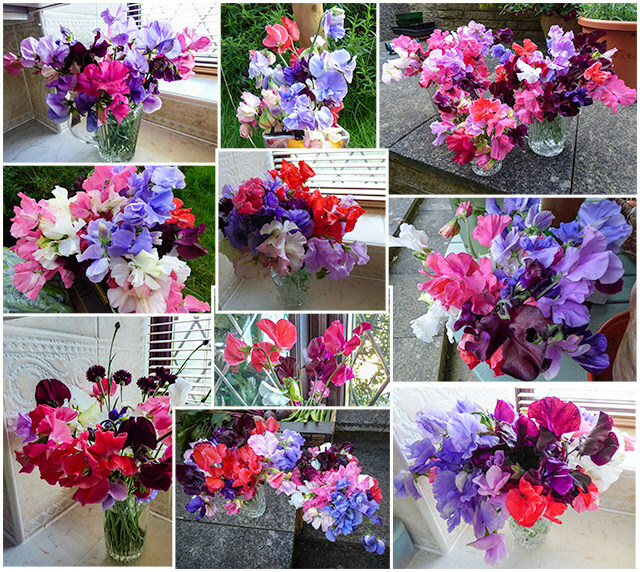 For several years now I have been planting different varieties of sweet pea trying to find a mix that I liked. I was looking for varieties that together created a mix of colours that I liked. I wanted most to have a good perfume - I would allow the odd one through without a perfume if the colour was exceptional as the perfume from others would compensate. Finally I wanted long, strong stems. Last year I thought that I had cracked it and decided to buy the same varieties this year with the exception of maybe one that didn't do as well as the others. What could be easier? No agonising over varieties - the choices were made. Out came the catalogue and cue disappointment. Of the nine varieties that I bought last year only three were in this year's catalogue. 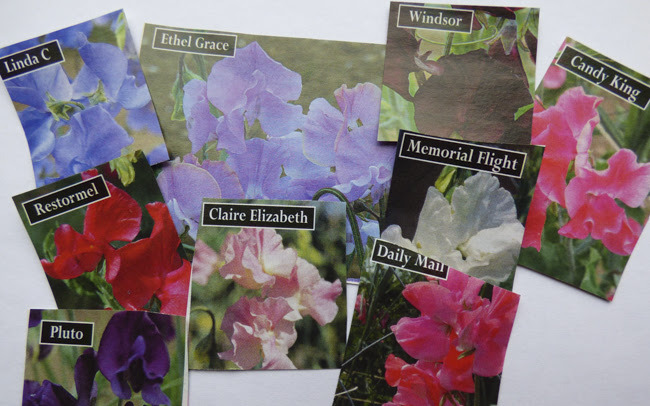 We buy most of our seeds from Kings and so I drew up this shortlist from their available varieties. I wanted a good colour mix but had about two varieties too many after my first trawl so which two to drop? In the end I dropped just one, Hannah Magovern as I didn't really need three reds. I'm sure that I'll be able to squeeze in the extra variety. All except for Midnight claim to be well or highly scented. Midnight scored on colour as I love the dark purple shades. The catalogue also claims that they are all good for cutting. We will see - what's the betting that, even if I like them, these varieties won't be available next year. If so any suggestions for alternatives? Last week's harvest was very similar to that of the previous week, I guess at this time of year it is what is expected. Two crops that didn't feature in last week's harvest were swede and beetroots. We hadn't grown swede for a few years as we never seemed to get around to sowing the seed in time. The seeds would be sown in modules and transplanted and the transplants were weedy things and didn't really produce much at all. This year we went for direct sowing and the plants grew better but the roots are smaller than expected and cramped for space. I guess that I'll just have to get over my aversion to thinning out the seedlings. The beetroot seems to manage without thinning, although it does suffer from the attentions of some underground nibblers. Fortunately most of the root is OK. So why the weeping over onions? It was nothing to do with chopping them. Incidentally I have a cure for this that doesn't involve sucking a spoon, wearing a peg on your nose or peeling underwater etc. I have found when I am wearing my contact lenses I can chop onions sniffle free. Sorry I digress. Our onions and shallots were stored in the allotment shed. Last week I noticed that some had mould growing in them and also that they were all very wet. I removed all the mouldy individuals and decided the bring the rest home to store in the summer house. I don't think we will be sitting in there any time soon. The next day everything was dry but will the damage have been done? All I can do now is to keep an eye on things and quickly remove any that start to rot. We really have had a problem drying onions and keeping them dry this year so we need a better solution. 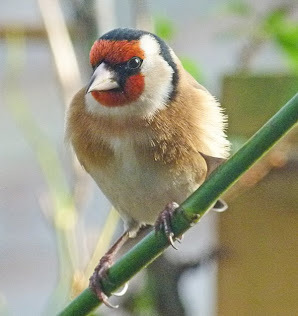 There is only room in the summer house now because we have used most of the apples that previously occupied the space. I was thinking some sort of shelving unit that would fold up to store away when not being used may work. What we really need is a cool dry basement but no chance of that! We took advantage of a decent day on Friday to pop to the allotment and have a spell of green gym exercise. I'm tackling an overgrown flower bed which given how wet and soggy everything is, and the fact that the predominant problem is couch grass and bindweed, is likely to be a very long job. Martyn was busy emptying the compost bins and spreading it around fruit bushes etc. As well as getting some fresh air and exercise we needed to replenish our fresh vegetable cache. Our collection was typical for the time of year. The parsnips are far larger than usual and, in spite of various protusions are longer rooted. One root had to be discarded as it was badly affected with canker and one in the photo above has a small patch so I hope this isn't going to be a major problem with the remaining roots. Conversely the leeks haven't really made the expected growth and are smaller than usual. The carrots are harvested from a late sown batch. These were a variety called Flyaway and sown as insurance when we thought the main sowing was making slow progress. They weren't protected as carefully from carrot fly attack but had enviromesh loosely draped over. The sowing was later - mid June -, after the first main carrot fly hatching period should have passed. I'm guessing the small amount of carrot fly damage in the harvested roots was caused by the second hatching which in theory is in September. Some fairly wonky individuals as usual but our carrots have character. We picked our first lot of Horbury sprouts - can they be called Brussels sprout when grown elsewhere? The outer leaves are a little nibbled but the sprouts are a good size and so should be fine once the damaged leaves have been removed. 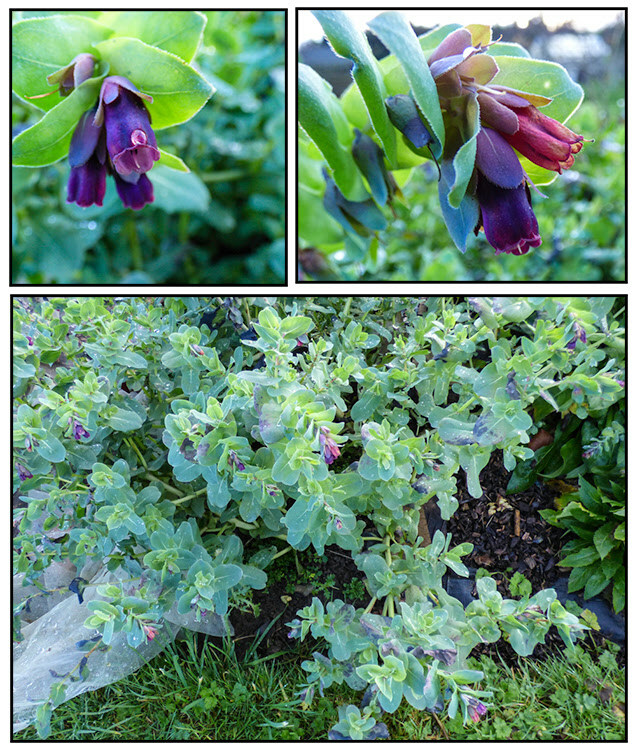 One surprise find was a patch of self sown cerinthe in full flower in spite of also displaying the odd frost nipped, blackened leaf. I cut a few sprigs to add to the few chrysanthemum flowers. The plants are producing a disappointingly small number of flowers this year. I also found one or two osteospernum flowers in the garden greenhouse. 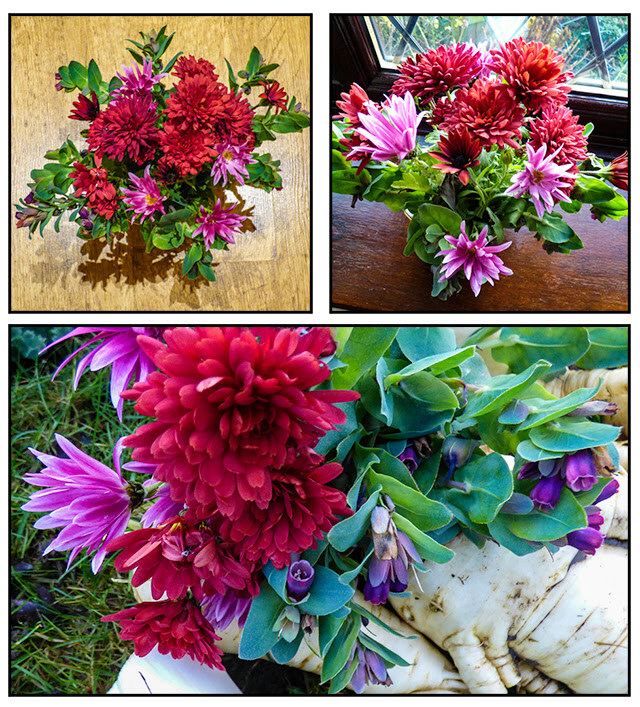 They are difficult to spot in the vase above as the flowers are exactly the same deep red as the chrysanthemums. Can you have too many beans? The chart below doesn't really fully reflect how our beans fared last season, it only relates to the beans actually picked to eat or freeze. We picked what we needed and could manage to pick before the beans grew too old and spoiled. If time and appetites allowed we could have harvested more. The broad beans were weighed before podding which I have to admit isn't my favourite job as I always end up with black stained nails. 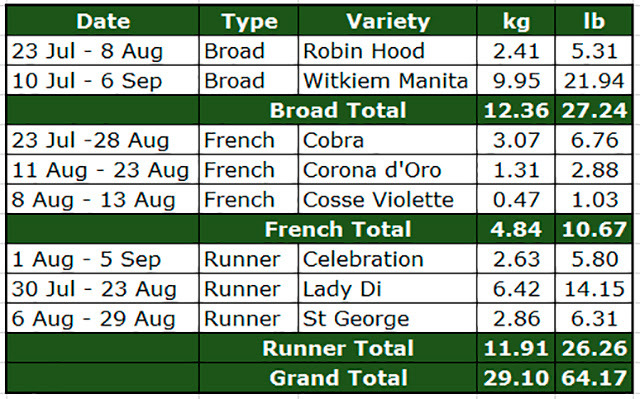 Robin Hood is a smaller plant producing smaller beans and so comparing the harvest from Witkiem Manita with Robin Hood isn't a fair comparison. Both produced well. We start the beans in small pots with two seeds to a pot. If both germinate which is more often than not the case, the resulting growth is treated as one plant and transplanted into holes cut through weed control fabric. If the seeds in one pot fail completely or I am short of plants to fill the required space I split the two small plants apart and plant separately. In the foreground above are Robin Hood. At the top of the photo the Witkiem Manita plants were already in flower. For some reason the flowers on Robin Hood were very variable. 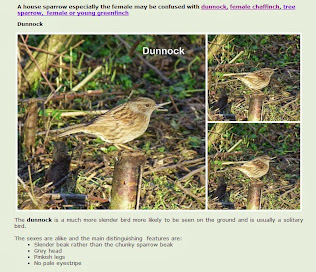 The ones in the above photo look a bit like a hyacinth and others were a brownish colour. 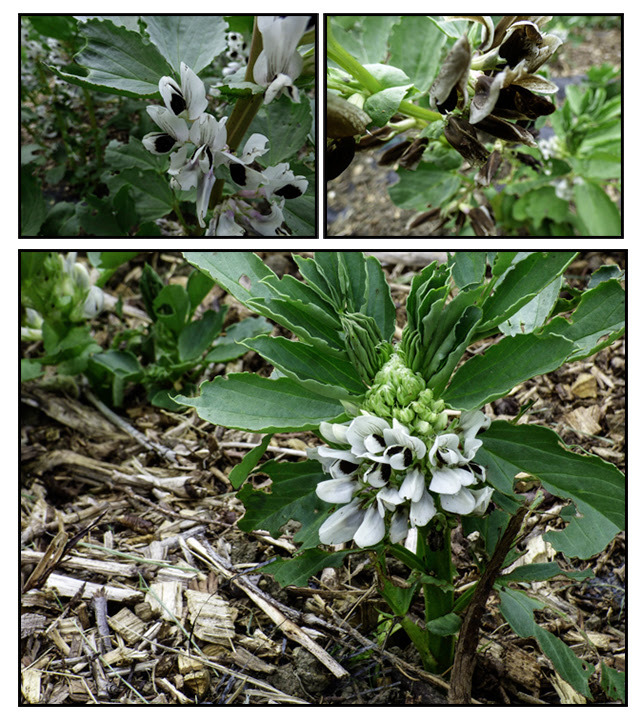 We don't stake the broad bean plants as they tend to support one another, however I created a cane barrier between the two varieties to prevent the later planted, smaller variety from being leaned on by the taller plants. The pea and bean weevils that devastated some pea seedlings also nibble the broad beans but being stronger growing they don't seem to be too badly affected. The photo below shows the tell-tale notched leaf edges where the weevils have feasted. The runner and climbing French beans are also sown two seeds to a pot with each pot of growth being planted at the foot of a bamboo cane. At this stage the young bean plants are at the mercy of slugs. The weevils don't bother them. 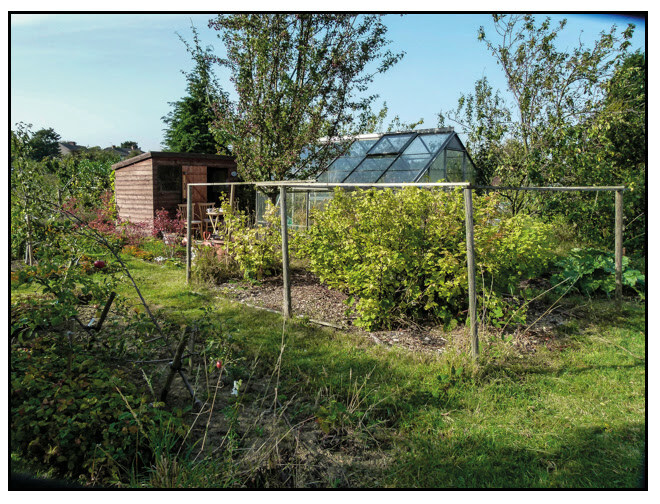 This year we feared that the slugs would wipe the young plants out and so we sprayed with Grazers slug deterrent. Whether this did the trick or not I can't say as we have no unsprayed plants to compare but the plants, although some nibbling was evident, certainly survived. 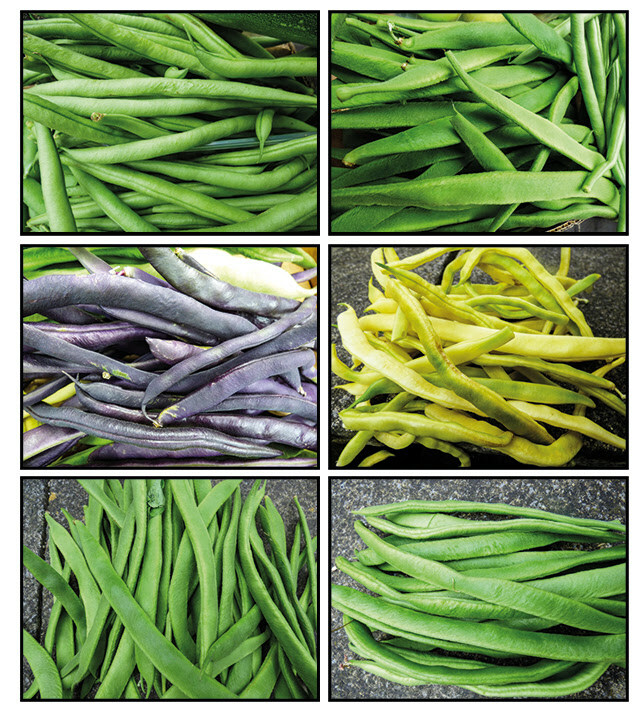 The three different varieties of climbing French beans are chosen for bean colour although the purple ones do revert to green after cooking. 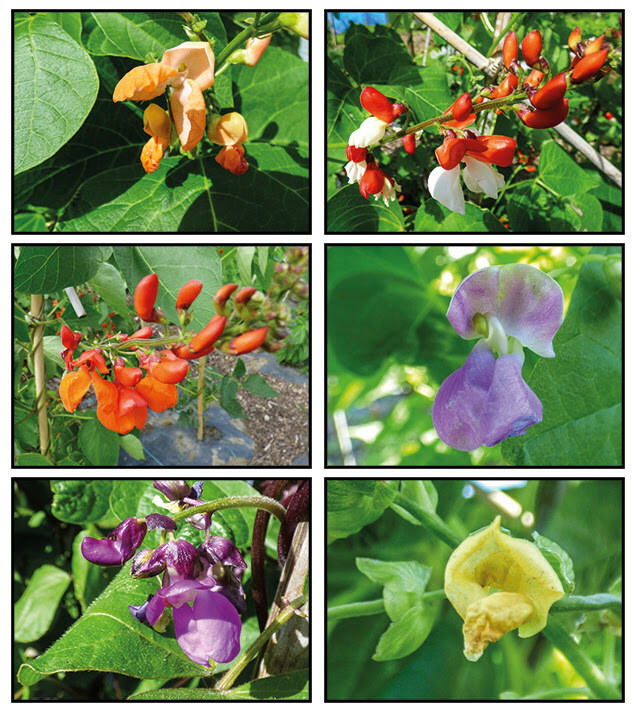 The three varieties of runner bean are chosen for flower colour. The problem - if indeed it can be called a problem - is that since we moved on to climbing rather than dwarf French beans, our combined harvest has increased and although we cut down on the number planted this year, we still had too many plants. It's such a shame that we can't buy bean seeds in smaller quantities as I think we may have to cut down on the number of varieties next year. Just out of interest, how long has anyone saved (bought) seed and it remained viable, If saving seed from your own plants does it come true to the parent as growing multiple varieties I am concerned that flowers would cross pollinate. If you haven't had enough more photos of our visit cam be viewed here. In reply to some comments on my Wordless Wednesday post this week, I mentioned that I used the burst facility on my camera when photographing wildlife. I realised that some people were not familiar with this facility and so thought I would try to explain what it is and when and why I use it. Obviously I can only show how to access this on my cameras but I think that the symbol to look for is the same on most cameras. I see it as a pile of photographs. On the Lumix FZ72 you need to press a button on the top right of the camera. On the FZ1000 you need to turn a dial on the top left of the camera. With the FZ72 when you press the burst button an on screen option allows you to set the burst speed at 2, 5 or 9 frames per second. In auto mode the number of shots taken is limited to three. 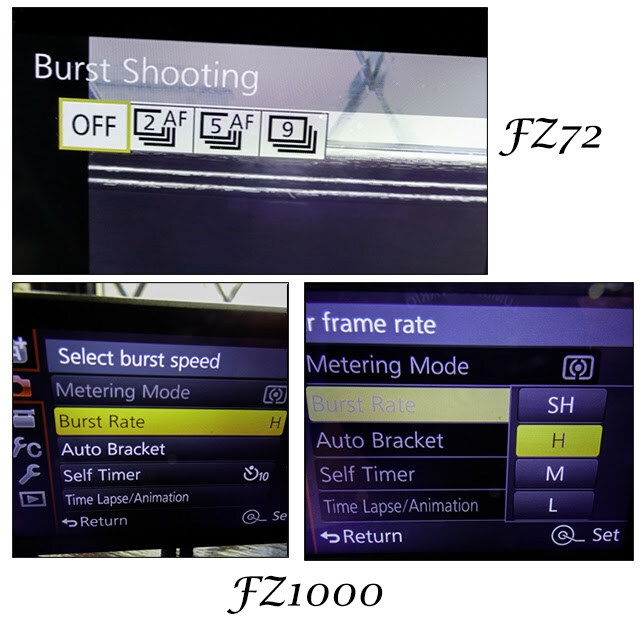 Using the FZ1000 you need to bring up the menu screen to set the burst rate. 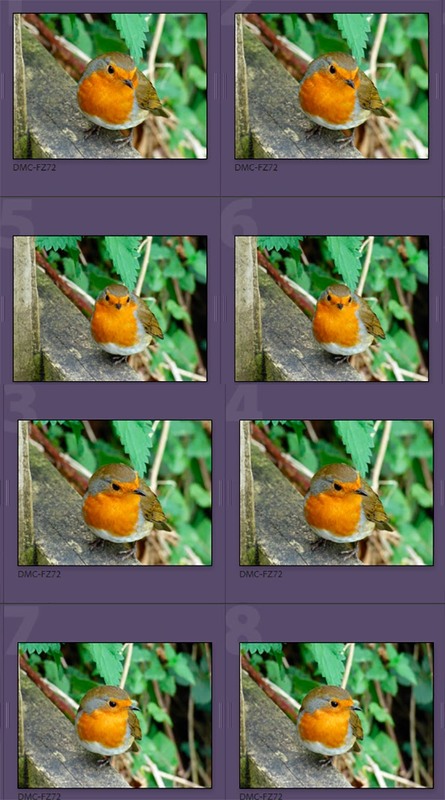 L is 2 frames per second, M is 7 frames, H is 12 frames and SH is 50. Once the shutter button is depressed on the FZ1000 the camera just keeps firing off shots. On SH the maximum is 60 shots at 50 frames per second. At the other speeds it depends on the size of your memory card. I have my burst rate set on H.
So when do I use burst mode? Mainly for taking photos of a subject that is moving or likely to move. 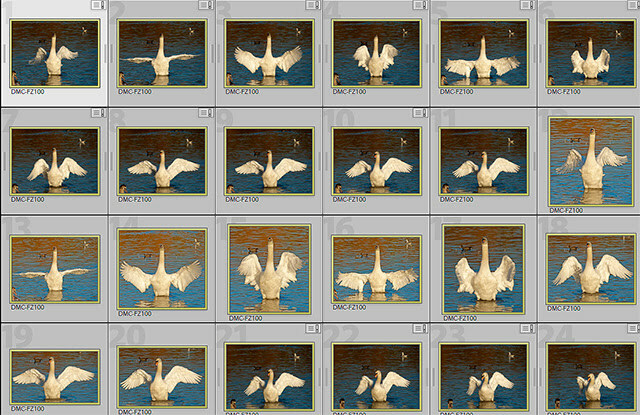 The advantage is that I can take multiple shots of an animal, bird or insect and choose a pose or poses that I like best. Firing off one shot can mean that the only shot you manage is blurred. A disadvantage, if you can call it one, is that you can end up with lots of images to sift through. Sometimes the differences are subtle - like above. I don't really take portraits but I can see how it could be useful to take multiple images and be able to capture the best expression or avoid the subject having their eyes shut. I also use burst when taking shots of steam trains. When the subject is fast moving it is difficult to compose a picture. Using burst I can choose shots where the engine is in the best position in relation to the landscape. 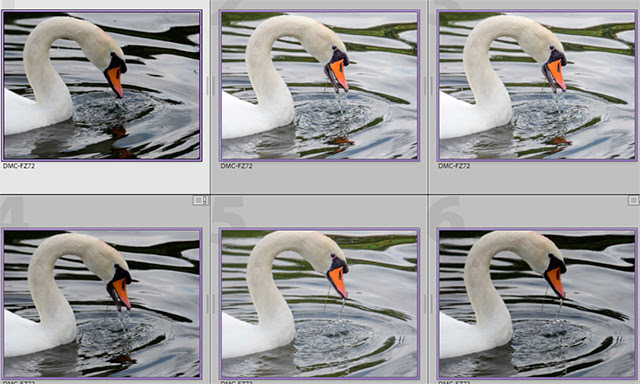 You may have been standing next to someone using burst mode and heard the repeated sound of the shutter firing. This can have the effect of frightening a subject that is fairly close like this robin. It would also annoy Martyn - or anyone else - standing close by filming video. For this reason I operate my camera in silent mode. The slight disadvantage in this is that I can't be absolutely sure that I have taken a picture, however, so far this hasn't been a problem. I have to admit until I started to write this post I hadn't realised that I could set the FZ1000 to take 50 frames a second so I have yet to try this - maybe next time that I am trying to photograph a bird in flight. There is one other thing that I should mention and that is that I often forget to switch off burst and end up with a series of identical landscapes images. I tend to work on the principle that it is better to have burst switched on when I don't need it than have it switched off when I do. Unwanted images are easily deleted. I must, however, try to remember to change out of the 50 frames per second mode when I have finished using it. 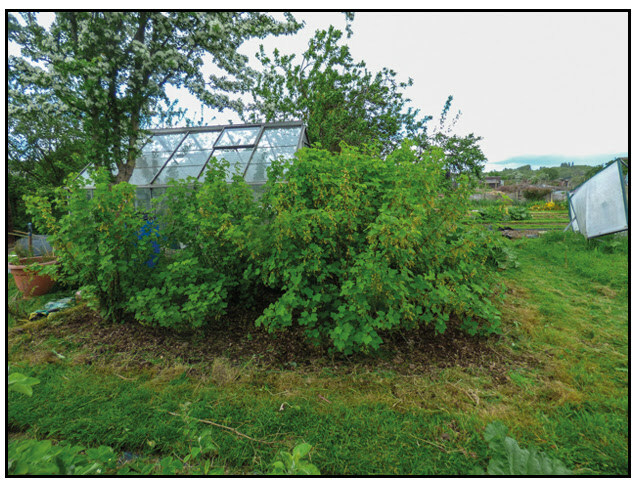 If you are a regular reader, you may remember that we have a redcurrant patch on our allotment that we inherited when we took on the plot. We have no idea what variety the six bushes are or even whether they are all the same variety but no matter as they are very productive. 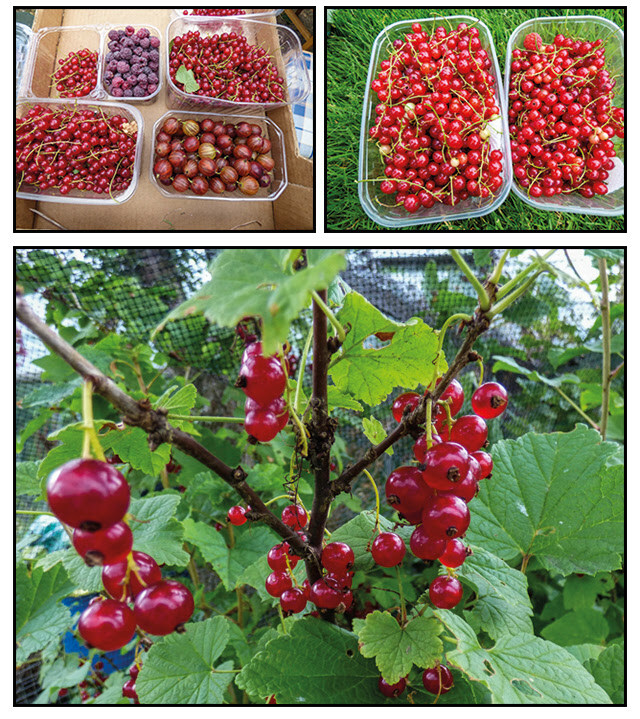 Each year they produce enough berries to fill our freezer with enough redcurrant compote to meet our needs with some left over to share with the birds. When we inherited the bushes they were hidden in grass and weeds as high if not higher than the bushes themselves. The bushes were already well established and so digging out and replanting wasn't an option so we had to settle for strimming around the plants and keeping things as tidy as we could. Once the bushes were in full leaf ang fruiting this was no easy task and each year, at some point, the grass claimed victory over us and provided ideal cover for the wasps' nest that I inadvertently stood in when picking the fruit. The wasps were not happy and neither was I especially as at the time I was trapped under netting with a full punnet of fruit in my hands. Again regular readers with be only too aware that we are fans of weed control fabric. 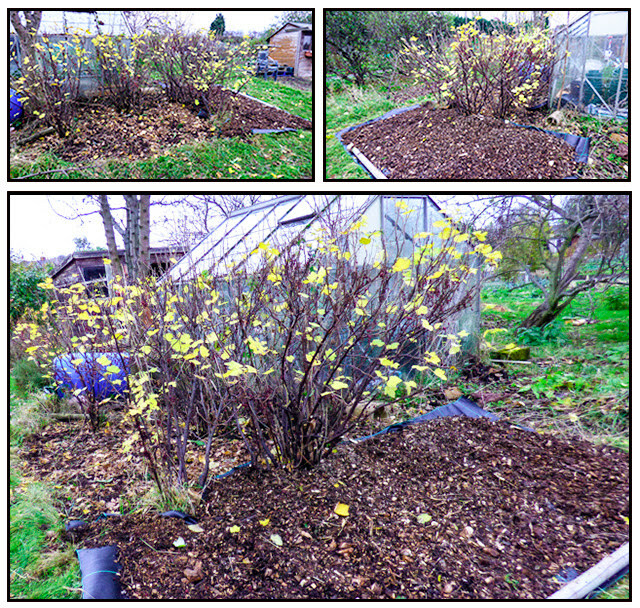 The redcurrant patch was where this all started. We decided to use the fabric under the redcurrants. Of course it would have been far more straight forward if we could have laid the fabric before planting but this wan't to be. 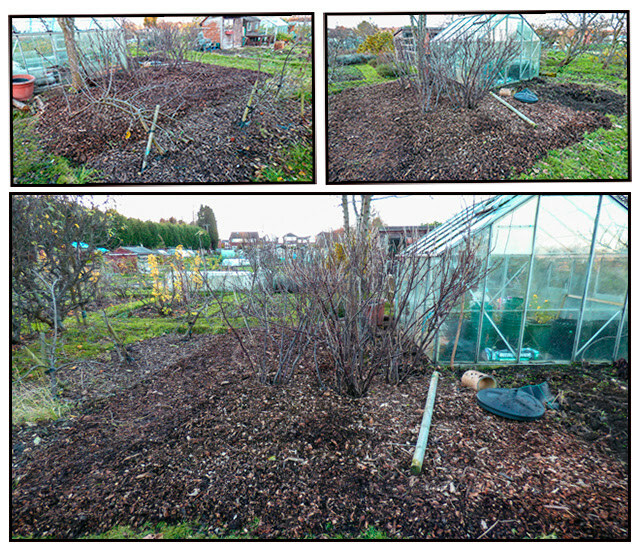 Once in place the fabric was mulched with wood chippings and edged with hazel poles cut from one of our bushes. Tree stakes were driven in to support netting as needed. We used wire netting around the lower half of our makeshift cage so inquisitive birds didn't become trapped when trying to find a way into the fruit. There were grass paths to three sides of the patch. One problem was that once the netting was in place it was difficult, (impossible) to keep the edges tidy so at the end of each season the net had to removed in order to tidy up. 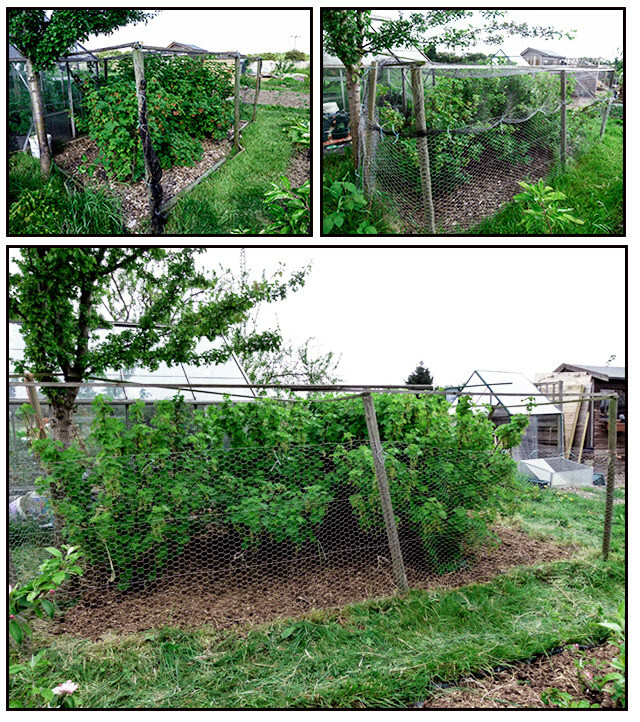 Also the bushes were outgrowing their allotted space and it was a bit of a struggle manoeuvring between and around them under the netting when harvesting. 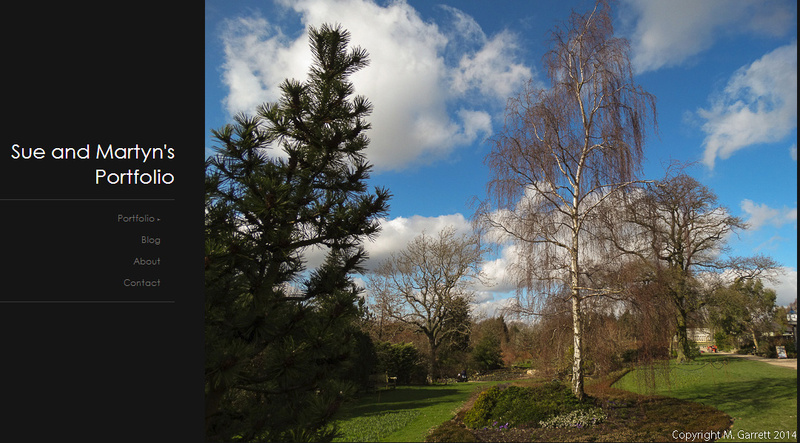 Also over time - the fabric was laid seven years ago which is hard to believe - some weeds do manage to colonise the mulch and the density of the planting meant that the only way to tidy up was to crawl about under the branches. This year we decided we needed to carry out some major renovation work. First job was to take down the cage. Framework removed we had to pull out any grass that had gained a foothold in the mulch. This was far easier than I expected as few roots had penetrated the fabric. 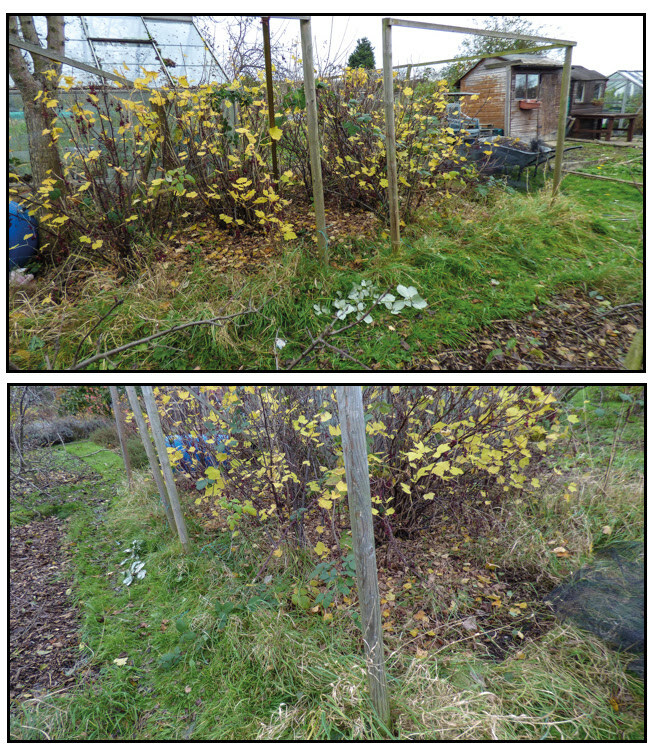 The brambles that had found a way through the planting holes were a different proposition. I had to be content with hacking them back and they will inevitably regrow so I will have to be alert and nip them off when I see them. 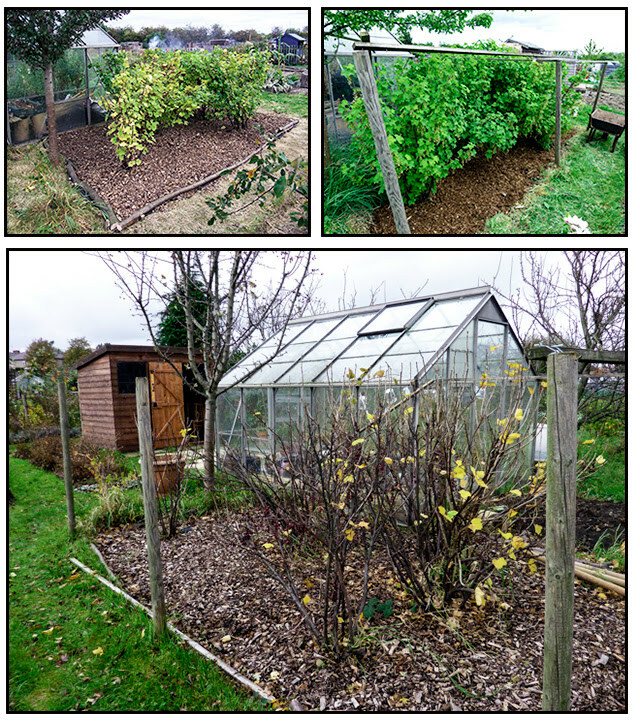 I also thinned out the bushes firstly removing the branches that always trailed onto the ground when laden with fruit and any that would block my route when harvesting. We decided to extend the mulched wcf/mulched area so that the posts for the cage could be fixed inside this area. In this way the grass wouldn't grow up against the netting. 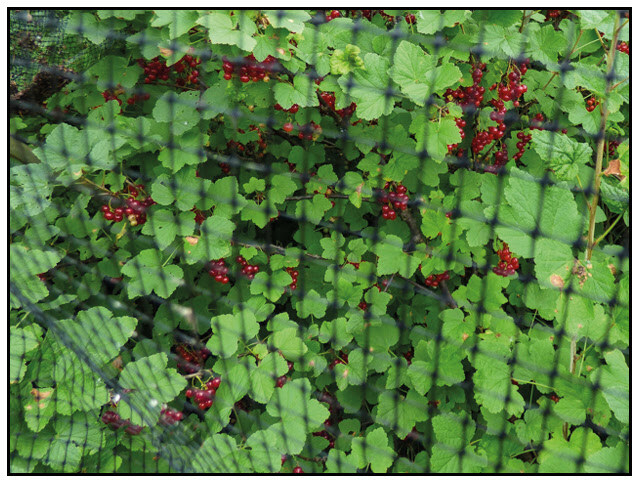 To one side of the bed a narrow grass path ran between the redcurrants and a bed containing some small apples trees. This wouldn't allow enough space to extend the cage so we decided to take out the grass and extend the fabric and mulch between the beds. Fortunately we have a free regular delivery of bark chippings courtesy of the council parks department. This should allow for the cage extension and walking space between the beds. We may need to demarcate the edge of the apple bed with some hazel poles. The idea now is to build a more substantial cage that can be a more permanent fixture. This can be done at a later date. I do have one bet with myself though. I bet the height of the cage is just high enough for me to get under and far too low for Martyn.